Long-term adult stem cells sustain tissue regeneration throughout the lifetime of an organism. They were hypothesized to originate from embryonic progenitor cells that acquire long-term self-renewal ability and multipotency at the end of organogenesis. The process through which this is achieved often remains unclear. Here, we discovered that long-term hair follicle stem cells arise from embryonic progenitor cells occupying a niche location that is defined by attenuated Wnt/β-catenin signaling. Hair follicle initiation is marked by placode formation, which depends on the activation of Wnt/β-catenin signaling. Soon afterwards, a region with attenuated Wnt/β-catenin signaling emerges in the upper follicle. Embryonic progenitor cells residing in this region gain expression of adult stem cell markers and become definitive long-term hair follicle stem cells at the end of organogenesis. Attenuation of Wnt/β-catenin signaling is a prerequisite for hair follicle stem cell specification because it suppresses Sox9, which is required for stem cell formation. Many tissues and organs in an adult’s body – including bone marrow, skin and intestines – contain a small number of cells called adult stem cells. These cells usually stay dormant within these tissues (at a site called a ‘niche’) until they are required to repair damaged or lost cells. At this point, adult stem cells can specialize, or ‘differentiate’, into the many different cell types that make up the tissue or organ where they reside. The cells that produce hairs are an example of adult stem cells. In mammals, hairs grow from structures called hair follicles that are found in the skin, and over the life of an animal, old hairs are shed and replaced. Previous research had suggested that certain embryonic cells are set to become hair follicle stem cells before the hair follicles emerge in the adult tissue. However it remained unclear how this decision is made, and which genes and molecules are involved in this process. Xu et al. have now found that, in mice, the fate of hair follicle stem cells is decided at an early stage in development, when the hair follicle is a simpler structure called a ‘hair peg’. Cells near the upper part of the hair peg tend to become dormant and adopt an adult stem cell fate, while the ones in the lower part are more likely to differentiate straight away. This shows that the position, hence the niche environment, plays a key role in determining these different cells’ fates. Xu et al. went on to discover that the decision for a cell to become a hair follicle stem cell relies on reduced signaling through the so-called Wnt signal pathway. Understanding how adult stem cells become established during development may help future efforts to grow tissues and organs in the laboratory for research purposes or organ transplantation. Long-term adult stem cells (SCs) are defined by their ability to continuously generate all downstream differentiated cell lineages as well as regenerate themselves throughout the lifetime of an organism (Fuchs and Chen, 2013). Although rudimentary tissue progenitor cells in embryos give rise to all cells in adult tissue, these cells are not SCs, because they are destined to change identity as development proceeds. It has been postulated that definitive tissue SCs originate from tissue embryonic progenitor cells that acquire the capacity for long-term self-renewal and multipotency at the end of organogenesis (Slack, 2008). However, the underlying cellular and molecular mechanisms of these processes remain unknown. Deciphering the process leading to localized SC emergence during normal embryonic development will likely reveal principles that can be used to acquire and maintain the long-term self-renewal and regenerative potentials that are prerequisites for SC-based therapies. Adult SCs in hair follicles (HFs) are located at the so-called ‘outer bulge region’. The bulge region constitutes the bottom of the permanent portion of a HF. It contains two layers of epithelial cells: the CD34- inner layer niche cells and the CD34+ outer layer stem cells. Although HFs begin to develop in the embryo, the bulge structure is only formed when HFs enter the first postnatal telogen (resting phase); this delineates the end of organogenesis and the emergence of the adult SC niche (Paus et al., 1999; Morris et al., 2004; Tumbar et al., 2004; Blanpain et al., 2004; Zhang et al., 2009; Hsu et al., 2011; Chen et al., 2012). Initiation of HF organogenesis is marked by placode emergence. Activation of Wnt/β-catenin signaling in basal epithelial cells by locally expressed Wnt ligands is both necessary and sufficient to induce placode formation (van Genderen et al., 1994; Gat et al., 1998; Huelsken et al., 2001; Andl et al., 2002; Jamora et al., 2003; Millar et al., 1999; Reddy et al., 2001; Fu and Hsu, 2013). Concomitant with Wnt ligand production, placode epithelial cells also express the Wnt inhibitor Dkk (Bazzi et al., 2007). The combination of the short-range activator Wnt and the long-range inhibitor DKK function in a reaction-diffusion mechanism to suppress Wnt/β-catenin signaling in cells surrounding existing placodes, thereby regulating HF spacing (Sick et al., 2006). 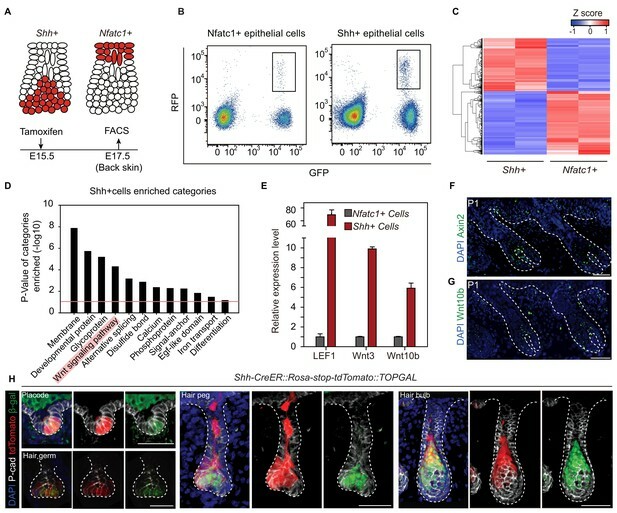 Contrary to the required activation of Wnt/β-catenin signaling, inhibition of BMP signaling through the dermal BMP inhibitor Noggin is necessary for placode morphogenesis (Jamora et al., 2003; Botchkarev et al., 1999; Kobielak et al., 2003). After placode formation, signaling events downstream of Wnts/BMPs drive HF to further develop into the hair germ and then the hair peg. Shh is expressed by placode epithelial cells (Oro et al., 1997; St-Jacques et al., 1998; Morgan et al., 1998). In the absence of Shh, dermal condensate fails to aggregate and HF development arrests at the placode stage instead of developing into the hair germ. This implicates Shh in establishing proper epithelial-mesenchymal crosstalk (St-Jacques et al., 1998; Oro and Higgins, 2003; Levy et al., 2007). Guard hairs, as the first HFs to appear in the embryonic backskin, are uniquely dependent on Eda/EdaR signaling (Laurikkala et al., 2002; Mustonen et al., 2004). Eda, which is itself a Wnt signaling target (Laurikkala et al., 2001), can induce the expression of BMP inhibitors and Shh in guard hair (Pummila et al., 2007). Placode progenitor cells generate all cells in adult HFs (Levy et al., 2007). Some of their progeny cease further development at a particular point and become definitive adult HFSCs. Previous studies using label-retaining methods demonstrated that putative HFSCs are present in postnatal developing HFs as slow cycling cells, and it was shown that their specification requires the transcription factor Sox9 (Nowak et al., 2008). Intriguingly, placode cells already express adult HFSC markers such as Lhx2 and Sox9, although in a largely non-overlapping pattern. Another HFSC marker, Nfatc1, appears in the subsequent hair peg (Rhee et al., 2006; Horsley et al., 2008; Vidal et al., 2005). These dynamic expression patterns suggest that cells in the placode and hair peg are heterogeneous. However, whether or not HFSC fate is already pre-determined at these early developmental stages is not clear. Other critical unanswered questions include the following: Are adult HFSCs remnant of embryonic progenitor cells that maintain their embryonic developmental potential, or do they, alternatively, come from progenitor cells that gain long-term potential? What are the underlying mechanisms? What determines the niche location and where do HFSCs become localized? The current study addresses these key questions. To uncover the cellular origin of HFSCs and to identify the time point of their specification, it will first be necessary to perform lineage-tracing experiments. These can be done by labelling distinct cell populations at the rudimentary stages and later determining whether SCs come from these initially labelled progenitor cells (Figure 1A). We chose tail skin HFs for this study. Unlike un-patterned back skin HFs (Figure 1—figure supplement 1A), tail skin HFs are arranged in triplets, and the growth of two secondary outer follicles is typically initiated next to a primary central follicle after it has already developed (Figure 1—figure supplement 1B). By inducing Cre activation at specific time points and focusing on HFs in a chosen area, we can label progenitor cells in defined developmental stages and continue to follow their fates in individual HFs until the end of organogenesis, when the bulge forms (Figure 1B,C; Figure 1—figure supplement 2A-C). Embryonic cellular origin of adult hair follicle stem cells. (A) Diagram of hair follicle morphogenesis and the lineage-tracing experiment. All lineage-tracing experiments ended at the first telogen, but started at different stages including the placode, hair germ, and hair peg stages. (B,C) Representative images of tail skin hair follicle organogenesis. Red boxes indicate the regions used for quantification in the lineage-tracing experiments. The hair cycle in tail skin progresses along the anterior to posterior and in the dorsal to ventral directions. At postnatal day 1 (P1), in the chosen region, the primary central hair follicles are in the hair peg stage while the secondary outer follicles are in the placode stage. At P15, in the chosen region, primary central hair follicles are in the telogen phase. Scale bar: 1500 μm for the whole mount image; 100 μm for the enlarged images. (D) Summary of the lineage-tracing experiments with: Shh-CreER::Rosa-stop-mTmG, Nfatc1-CreER::Rosa-stop-mTmG, and Lgr5-GFP-CreER::Rosa-stop-tdTomato::K14H2BGFP mice. Percentages of labelled HFSCs at the telogen phase were quantified using whole mount sample images. Representative images are single confocal Z slices from the data used for quantification. N=5 mice, >200 HFs. Raw data are plotted to the left of each box-and-whisker plot: the median and the 25th and the 75th percentiles are denoted by notches and the bottom and top boxes, respectively; the 5th and 95th percentiles are denoted as whiskers. Scale bar: 50 μm. (E) In both the hair germ and the hair peg, the progenies of Shh+ cells in the center of HFs express the differentiation marker Keratine 6 (Krt6). Scale bar: 50 μm. (F) Lineage-tracing experiment starting at the hair peg stage and ending at morphogenesis anagen (growth phase) using Nfatc1-CreER::Rosa-stop-mTmG mice. Note that the labeled cells stay dormant at their original position without contributing to HF down growth. Scale bar: 50 μm. (G) Model depicting the spatial and temporal pattern of hair follicle stem cell emergence. To test whether distinct HFSC precursors are already present at the initial developmental stages, we used several CreER knock-in lines that can label different cell populations of the placode, hair germ, and hair peg. Shh starts to be expressed in the placode (St-Jacques et al., 1998). When we used inducible Shh-CreER::Rosa-stop-mTmG (Harfe et al., 2004) mice to label Shh-expressing cells in either the placode or the hair germ, we found that in both cases Shh+ progenitors cells can become HFSCs (Figure 1D). Unexpectedly, Shh-expressing hair peg cells lost the ability to form HFSCs and mostly contributed to differentiated lineages (Figure 1D,E). Since Shh-expressing placode cells generate the majority of cells in hair peg, including those still expressing Shh, this intriguing change in cell fate indicates that progenies of Shh-expressing placode cells separate into two different populations: the population still expressing Shh loose the potential to form HFSCs, while the cells with down regulated Shh expression in hair peg can presumably still become HFSCs. Consistent with this hypothesis, two adult HFSC markers, Lgr5 and Nfatc1, first begin to be expressed in hair peg, with complementary patterns to that of Shh (Figure 1D). Using Nfatc1-CreER::Rosa-stop-mTmG mice (Tian et al., 2014), we found that Nfatc1-expressing cells first appear at the upper hair peg and remain relatively dormant there, without actively contributing to HF down growth (Figure 1F). Then, at the end of organogenesis, Nfatc1-expressing hair peg cells become the sebaceous gland above bulge and most of the HFSCs (Figure 1D). A second HFSC marker, Lgr5, follows a similar pattern, albeit with different cell fate preferences. Using Lgr5-GFP-CreER::Rosa-stop-tdTomato mice (Jaks et al., 2008), we found that Lgr5-expressing cells appear first in the middle portion of the hair peg. They eventually become HFSCs in the lower bulge and secondary hair germ cells below the bulge (Figure 1D). The labeling efficiencies of the CreER lines used here were very high; almost all the HFs in the chosen region targeted for quantifications were labeled, and we did not detect any leaky induction in the absence of Tamoxifen injection (Figure 1—figure supplement 2D-G). Collectively, these results suggest that HFSCs originate from progenitor cells in hair peg that lose Shh expression but gain the expression of adult stem cell markers (Figure 1G). 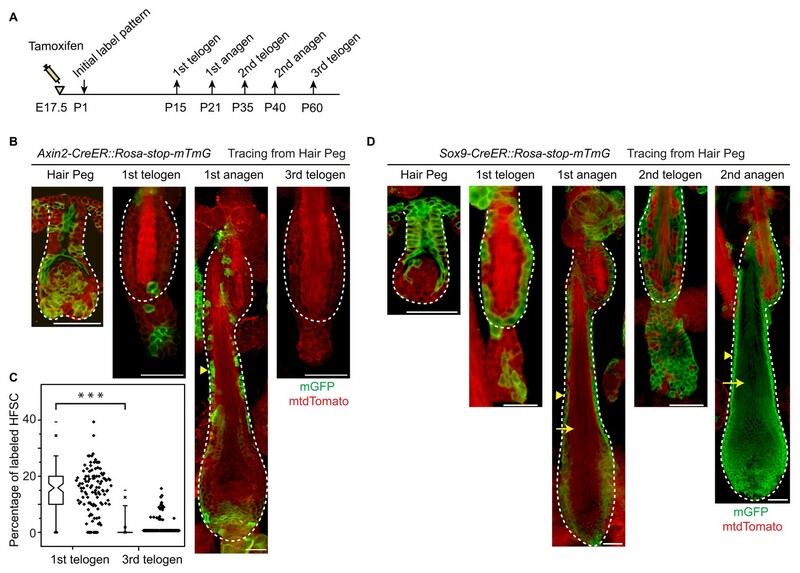 The hair peg SC precursors are distinguished from the broader placode and hair germ cells in that they stop further development once they are specified. During subsequent HF down growth, these cells remain dormant in their original position until the end of organogenesis. At that point, they incorporate into the outer layer of the bulge and become HFSCs. This leads to an interesting question: is the reason these cells gain expression of stem cell markers and become dormant due to signals that they receive at the specific upper follicle position? We used a two-photon laser to precisely ablate SC precursors in hair peg labeled by Nfatc1-CreER::Rosa-stop-tdTomato::K14H2BGFP (Figure 2A,B). Successful and precise cell ablation was achieved without affecting normal development of neighboring HFs (Figure 2—figure supplement 1A) (Rompolas et al., 2012). Following complete ablation of Nfatc1-CreER-labeled cells, we observed de novo bulge formation at the end of organogenesis (Figure 2C). The newly formed bulge even had the same number of SCs as the control HFs (Figure 2D). To achieve maximum labeling and ablation efficiency of Nfatc1+ cells, we conducted the ablation experiment only in HFs along the anterior-posterior midline of the dorsal tail skin, as this region has the highest Tamoxifen induction efficiency (Figure 2—figure supplement 1B). Under this condition, almost all SCs in neighboring control HFs were tdTomato positive, while the de novo formed SCs in the ablated HFs were all tdTomato negative (Figure 2E). Importantly, the de novo formed HFSCs were functional as indicated by their ability to support HF down growth (Figure 2F-I and Figure 2—figure supplement 1C). These results indicate that niche location in hair peg determines HFSC fate. Niche position in the hair peg determines hair follicle stem cell fate. To understand the underlying mechanism leading to niche-induced HFSC specification, we profiled the expression of mRNA isolated from purified hair peg cells expressing Shh or Nfatc1 (Figure 3A-C). For the purpose of identifying niche-defining factors, we focused on genes associated with extracellular signal paths. Rather than identifying signals that were uniquely present in hair peg niche occupying cells (Nfatc1+ cells), we found signals that were uniquely absent from these cells. Based on DAVID functional gene annotation analysis (Dennis et al., 2003), among genes that were expressed ≥2-fold more in Shh+ cells than in Nfatc1+ cells, we found that genes of the Wnt signaling pathway were enriched prominently (Figure 3D). Several canonical Wnts and some well-known Wnt/β-catenin target genes, including Axin2, were highly expressed in Shh+ cells (Figure 3—figure supplement 1, Figure 3—source data 1). Using either real-time PCR or in situ hybridization, we confirmed that Axin2, Wnt10b, Wnt3, and Lef1 were all expressed at higher levels in Shh+ cells than in Nfatc1+ hair peg cells (Figure 3E-G). We then used TOPGAL Wnt/β-catenin signal reporter mice to validate the patterns we had observed. Starting in the placode stage and persisting through to subsequent development stages, Shh+ cells showed consistent co-localization with β-gal+ cells (Figure 3H). These results suggest that the hair peg niche position is associated with an absence of Wnt/β-catenin signaling. Unbiased RNA-seq analysis reveals factors that define the hair peg niche. (A) Diagram of the FACS experiments using Nfatc1- and Shh-CreER::Rosa-stop tdTomato::K14H2BGFP mice. (B) FACS isolation of distinct GFP+RFP+ populations to obtain Shh+ and Nfatc1+ epithelial cells. (C) Unsupervised hierarchical clustering and heat map display of genes that were differentially expressed between Shh+ cells and Nfatc1+ cells. N=2 (D) Gene Ontology analysis of ≥2-fold up-regulated genes in Shh+ cells compared to Nfatc1+ cells. The Wnt signaling pathway is highlighted. (E) Validation of differentially expressed genes using qPCR. N=3. (F–G) In situ staining of Axin2 (F) and Wnt10b (G) in developing hair follicles. (H) Shh+ cells are Wnt/β-catenin signal responsive cells. Shh expression was represented by tdTomato in Shh-CreER::Rosa-stop-tdTomato mice. Wnt/β-catenin-responsive cells were detected by β-gal staining in TOPGAL mice. Scale bars: 50 μm. To directly test whether or not attenuated Wnt/β-catenin signaling in epithelial cells was correlated with HFSC specification at the hair peg stage, we conducted experiments with Axin2-CreER::Rosa-stop-mTmG mice (Lim et al., 2013). As expected, Wnt/β-catenin signal responsive cells in placode give rise to most of the HFSCs (Figure 4A,B) (Huelsken et al., 2001). This clear correlation at the placode stage was dramatically decreased at the hair germ stage, and even further decreased at the hair peg stage. Only a very small proportion of HFSCs came from Axin2+ hair peg cells; the majority of HFSCs came from Axin2- hair peg cells (Figure 4A,B). This suggests that from the placode stage to the hair peg stage, cells that maintain active Wnt/β-catenin signaling have dramatically decreased potential to form HFSC. Attenuated Wnt/β-catenin signaling is uniquely associated with hair follicle stem cell specification. (A–B) Lineage tracing with Axin2CreER::Rosa-stop-mTmG mice. N=5 mice, >120 HFs. (C) Descendants of Gli1+ cells were represented by the expression of tdTomato in Gli1-CreER::Rosa-stop-tdTomato::K14H2BGFP mice. Note that Gli1+ descendants are located in almost all the hair follicle cells at the placode, hair germ, and hair peg stages. (D) Descendants of Id2+ cells were represented by the expression of tdTomato in Id2-CreER::Rosa-stop-tdTomato::K14H2BGFP mice. Note that Id2+ descendants were only located at the hair bulb stage matrix and pre-cortex area. (E) Diagram summarizing the descendants of the Wnt-, Shh-, and BMP-signal responsive cells at different early developmental stages. Scale bars: 50 μm. During HF down growth, several signaling pathways are known to be involved in promoting the differentiation or changes in cell fates (Millar, 2002). Although the Wnt/β-catenin signaling pathway is the only such pathway identified from our RNA-seq results, we checked to see if similar associations existed for other pathways. We used Gli1-CreER::Rosa-stop-mTmG mice to detect descendents of Shh signal-responsive cells and Id2-CreER::Rosa-stop-mTmG mice to detect descendents of BMP signal-responsive cells (Ahn and Joyner, 2004; Rawlins et al., 2009). Almost all the HF cells were Gli1+ in all the early developmental stages examined (Figure 4C). Id2 only became active in terminally differentiated hair bulb cells after future HFSC fate had been specified (Figure 4D). The results from these experiments indicate that attenuated Wnt/β-catenin signaling is uniquely associated with the HFSC-inducing niche location in hair peg (Figure 4E). To investigate whether the observed correlation of attenuated Wnt/β-catenin signaling with HFSC specification is a functional requirement, we increased Wnt/β-catenin signaling in cells occupying hair peg niche position to see if that would affect HFSC specification. This was achieved by using Nfatc1-CreER::Exon3-Ctnnb1fl/wt mice (Harada et al., 1999). Activation of canonical Wnt/β-catenin signaling in Nfatc1+ cells was confirmed by nuclear β-catenin staining (Figure 5A,B). Initial HF development was normal in exon3-Ctnnb1 heterozygous (Het) mice. However, after morphogenesis, rather than entering a new hair cycle like the WT, the hair shafts of Het mice were shed (Figure 5—figure supplement 1A,B). Section staining revealed that bulge formation was completely abolished in exon3-Ctnnb1 Het mice. There were disorganized Keratin6+ cells where the bulge should have been, but there were no cells expressing the HFSC markers CD34 or Sox9 (Figure 5C-E). Thus, when Wnt/β-catenin signaling was increased in hair peg niche-occupying cells, neither HFSCs nor the bulge niche formed at the end of organogenesis. Elevated Wnt/β-catenin signaling abolishes hair follicle stem cell specification and suppresses Sox9 expression in hair follicles. (A) Diagram of the experiments using Nfatc1-CreER::Rosa-stop-tdTomato::Exon3-Ctnnb1fl/wt mice. (B) Nuclear β-catenin staining indicates successful activation of Wnt/β-catenin signaling in upper hair follicle. (C–E) Abolished bulge niche formation and hair follicle stem cell specification in exon3-Ctnnb1 Het HFs compared to WT HFs. Krt6 (C) is a marker for inner layer bulge cells serving as a niche that can maintain quiescence for outer layer HFSCs. Sox9 (D) and CD34 (E) are adult hair follicle stem cell markers. (F) Wnt/β-catenin signal responsive cells, represented by β-gal positive cells in TOPGAL mice, do not express Sox9 during normal development. (G) Activation of Wnt/β-catenin signaling suppresses Sox9 expression in vivo. The arrows point to protrusions resulting from elevated Wnt/β-catenin signaling in exon3-Ctnnb1 Het HFs. (H) Diagram of the experiments using K14-rtTA::teto-Cre::Ctnnb1fl/fl mice. β-catenin is conditionally deleted in epithelial cells by feeding mice with Doxycyclin from E17.5 to P11. Samples were taken at P1 and P11. (I–J) Loss of Wnt/β-catenin signaling leads to expanded Sox9 expression in HFs at both the hair germ stage (I) and in postnatal skin (J). Scale bars: 50 μm. Interestingly, with increased time, the exon3-Ctnnb1 Het mice started to generate new hair coats with normal bulges and HFSCs that expressed CD34 and Sox9 (Figure 5—figure supplement 1A-C). Cells expressing exon3-Ctnnb1 have spontaneously disappeared from HFs, and the remaining mosaic WT cells organized into a de novo niche after entering the normal hair cycle process (Figure 5—figure supplement 1D). These observation further supports our conclusion that attenuated Wnt/β-catenin signaling is required for HFSC fate specification. It is intriguing that Sox9 expression is not present in cells with elevated Wnt/β-catenin signaling. Sox9 is known to be an essential intrinsic factor that is required for HFSC formation. Ablation of epithelial Sox9 completely blocks HFSC specification (Nowak et al., 2008). To determine if the canonical Wnt signal suppresses Sox9 expression in HFs, first we observed that in normal developing HFs, Sox9 expressing cells and Wnt/β-catenin signal responsive cells are mutually exclusive (Figure 5F). Second, soon after activation of Wnt/β-catenin signaling in Nfatc1+ cells, we observed small protrusions from HFs that were positive for nuclear β-catenin. Sox9 expression in these small protrusions was completely absent, while cells immediately next to these protrusions express Sox9 (Figure 5G). Lastly, in the Wnt/β-catenin loss of function mutant (K14-rtTA::teto-Cre::Ctnnb1fl/fl) (Nguyen et al., 2006; Perl et al., 2002), HF development is defective but Sox9 expression is expanded to the extent that all remaining cells in HFs express Sox9 (Figure 5H-J). These results suggest that the Wnt/β-catenin signaling suppresses Sox9 expression in HFs. Given that the loss of Sox9 expression completely blocks HFSC specification, the requirement for attenuation of Wnt/β-catenin signaling as a prerequisite for HFSC specification is related to enabling Sox9 expression. It is noteworthy that hair shaft formation is aborted in K14-rtTA::teto-Cre::Ctnnb1fl/fl mice (Figure 5—figure supplement 1E,F). This indicates that epithelial Wnt/β-catenin signaling is required for progenitor cell differentiation, and may further explain why activation of Wnt/β-catenin signaling prevents HFSC formation. Given that attenuated Wnt/β-catenin signaling is required for HFSC specification, it was puzzling to observe that a small portion of HFSCs originated from Axin2+ hair peg cells (Figure 4A,B). This suggests that there are two origins of HFSCs: a small portion of HFSCs come from hair peg cells maintaining active Wnt/β-catenin signaling, while the majority HFSCs come from progenitor cells with attenuated Wnt/β-catenin signaling in hair peg. To investigate the long-term consequences of this heterogeneity, we followed the fates of HFSCs from the two different origins through multiple hair cycles; the Wnt/β-catenin signal positive origin was represented by the Axin+ lineage while the Wnt/β-catenin signal negative origin was represented by the Sox9+ lineage (Figure 6A). Embryonic Wnt/β-catenin signaling diminishes the long-term self-renewal ability of hair follicle stem cells in adult. (A) Diagram depicting the time points of the lineage tracing experiment. (B–C) Long-term lineage tracing experiments using Axin2-CreER::Rosa-stop-mTmG mice. Note the disappearance of labelled HFSCs in the third telogen. Representative images shown are single confocal Z slice from the data used for quantification. N=3 mice, >110 HFs. ***p<0.0001. (D) Long-term lineage tracing experiments with Sox9-CreER::Rosa-stop-mTmG mice. Arrowheads indicate ORS and arrows indicate terminally differentiated layers. Note the change in downstream progeny fates of labeled cells at different hair cycles. Scale bars: 50 μm. Consistent with results presented in Figure 4A, ~15% of HFSCs in the first telogen originated from Axin2+ hair peg cells. In the first growth phase (anagen) following the first telogen, these HFSCs contributed to both outer root sheath (ORS) cells and to matrix differentiating cells (Figure 6B). Of note, after two full hair cycles, in the third telogen, Axin2+ hair peg cell formed HFSCs have been mostly exhausted (Figure 6C). On the contrary, Sox9+ hair peg precursor cells were the origin of most of the HFSCs at the first telogen. During the first anagen, these HFSCs contributed preferentially to ORS rather than to the differentiated lineages in the matrix. Instead of decreasing, HFSCs originated from Sox9+ hair peg cells persisted and expanded after one round of hair cycle to become essentially all of the HFSCs in the bulge and most of the secondary hair germ cells below the bulge. For the second anagen, the labeled HFSCs generate all of the downstream lineages including, ORS, matrix, and hair shaft cells (Figure 6D). These results suggest that embryonic Wnt/β-catenin signaling diminishes the long-term potential of HFSCs. We have shown that Wnt/β-catenin signaling is required for terminal differentiation of the hair shaft. Also it suppresses Sox9 expression, which is important for HFSC maintenance through inhibition of differentiation (Kadaja et al., 2014). So it is possible that embryonic exposure to Wnt/β-catenin signaling primes the embryonic cells for differentiation via both positive induction and lack of Sox9 expression. This ultimately results in diminished long-term potential of the HFSCs. Our study elucidates the cascade of events that lead to long-term SC emergence in HFs during organogenesis (Figure 7). Wnt/β-catenin signaling is necessary for HF initiation (Andl et al., 2002; Ito et al., 2007). Early placode cells are Wnt/β-catenin signal responsive cells, and they generate all of the cells in adult HFs. At the hair peg stage, a localized Wnt/β-catenin signaling free zone emerges in upper HF. Progenitor cells residing in this embryonic niche position stop further development and become HFSCs at the end of organogenesis. These established HFSC precursor cells are not just remnants of embryonic progenitor cells, because they gain the expression of adult HFSC markers including Nfatc1. Embryonic cells residing in this Wnt/β-catenin signaling free zone, together with a few other cells located below them that have active Wnt/β-catenin signaling, give rise to the adult HFSC pool. However, only the HFSCs derived from Wnt/β-catenin signaling negative precursor cells have long-term self-renewal ability and can continuously support regeneration. The small portion of HFSCs that are derived from embryonic cells with active Wnt/β-catenin signaling are highly prone to differentiation as the hair cycle progresses and are soon exhausted after regeneration. So, in embryos, the attenuation of Wnt/β-catenin signaling not only defines the adult niche position and HFSC fate, but also has a long lasting effect on the subsequent fate choice and long-term potential of cells in adults. Model illustrating that long-term hair follicle stem cell emergence results from progenitors occupying an embryonic niche location, which is defined by the absence of Wnt/β-catenin signaling that would otherwise block the expression of a key factor required for stem cell specification. It’s noteworthy that we observed largely none overlapping labeling patterns of Lgr5+ and Axin2+ cells in hair peg (Figure 6B, Figure 6—figure supplement 1B). Also, Lgr5+ hair peg cells contributed HFSCs persist after multiple hair cycles instead of completely diminishing like Axin2+ cells contributed HFSCs (Figure 6—figure supplement 1). These results indicate it is possible that in hair follicle Lgr5 expression either reflects very low level of Wnt signaling, or it is induced by a different set of Wnt ligands than those induce Axin2. Although we were able to pinpoint the main mechanism through which Wnt/β-catenin signaling blocks long-term HFSC formation, i.e. the suppression of Sox9 expression, we suspect that this might not be the only mechanism involved in this process. It has been reported previously that Sox9 expression is induced by Shh signaling (Vidal et al., 2005). Given that we observed extended activity of Shh signaling throughout follicle epithelial cells and observed only localized activity of Wnt/β-catenin signaling in lower follicle cells, we can explain the mutually exclusive pattern of Sox9+ and Wnt/β-catenin signaling responsive cells. As development proceeds, the Sox9 expression pattern continues to expand and become wider than the actual future bulge region; for example, Sox9 is expressed in most of the ORS cells. So, following the emergence of the Wnt/β-catenin signaling free zone in the hair peg, there are probably other mechanisms that help maintain the restricted niche position. One observation further supporting this hypothesis is that, once initiated in hair peg, the expression of Nfatc1 is restricted to the upper HF where the future sebaceous gland and bulge will be; Nfatc1 expression does not expand to the broader ORS like Sox9 expression does. Nfatc1 was reported to be a target of BMP signaling in adult HFs (Horsley et al., 2008). However, we did not observe active BMP signaling at the hair peg niche location using a BMP reporter, a result similar to a published staining pattern of pSMAD1/5 in developing HFs (Kandyba et al., 2014). So, it remains to be determined which, if any, other mechanisms lead to the maintenance of a more restricted niche region that is reflected by the localized expression of stem cell markers. Since attenuated Wnt/β-catenin signaling defines the niche location and long-term HFSC fate, the process of exactly how the Wnt/β-catenin signaling free zone emerges is of great interest. We observed increased expression of Wnt inhibitors such as SFRPs in Nfatc1+ hair peg cells as compared to Shh+ hair peg cells. However, given that HFSC precursor cells can be replaced by embryonic cells occupying the same hair peg niche position, it is unlikely that Wnt inhibitors expressed by the precursor cells themselves are the main causes of attenuated Wnt/β-catenin signaling in that position. Our RNA seq analysis revealed enrichment of Wnt and Dkk expression in Wnt/β-catenin signal positive Shh+ hair peg cells as compared to Nfatc1+ hair peg cells. We hypothesize that the combination of the lack of Wnt ligands, which are short-range signal molecules, and the presence of Wnt inhibitors such as DKK4, which are long-range signal molecules, at the embryonic niche location is the main reason contributes to the emergence of a Wnt/β-catenin signaling free zone in upper hair peg. A similar model has been used to explain HF density determination and epidermal SC regulation (Sick et al., 2006; Lim et al., 2013). To directly test the suppositions of this hypothesis, the protein localization patterns of Wnt and DKK will need to be dissected. Nfatc1-CreER mice were generated and provided by Dr. Bin Zhou (Tian et al., 2014). K14-H2BGFP mice were kindly provided by Dr. Elaine Fuchs. The Shh-CreER (Harfe et al., 2004), Lgr5-GFP-CreER (Barker et al., 2007), Axin2-CreER (Lim et al., 2013), Id2-CreER (Rawlins et al., 2009), Gli1-CreER (Ahn and Joyner, 2004), Rosa-stop-mTmG (Muzumdar et al., 2007), Rosa-stop-tdTomato (Madisen et al., 2010), TOPGAL (DasGupta and Fuchs, 1999), Ctnnb1fl/fl (Huelsken et al., 2001), Exon3-Ctnnb1fl/fl (Harada et al., 1999), K14-rtTA (Nguyen et al., 2006), and teto-Cre (Perl et al., 2002) mice have all been described previously. We generated the Sox9-CreER mice by integrating IRES-CreERT2-SV40pA cassettes into the 3' UTR of the endogenous mouse Sox9 gene, before the aacatggaggacgattggagaatc sequence via Cas9/RNA mediated gene targeting in zygotes. To perform the lineage tracing experiments, female Rosa-reporter mice were mated with male mice of the following genotypes: Shh-, Lgr5-GFP-, Nfatc1-, Axin2-, Gli1-, Sox9-, and Id2-CreER. For the calculation of embryonic time points in the timed pregnancy experiments, the morning of the vaginal plug date was designated as embryonic stage 0.5 (E0.5). Cre activity was induced at E16.5 or E17.5 by a single intraperitoneal injection of Tamoxifen dissolved in sunflower oil/10% ethanol. Solutions ranging from 10–20 mg/ml were used with the following dosage on the basis of body weight: pregnant mothers of the Shh-, Nfatc1-, Axin2-, Gli1-, Sox9- and Id2-CreER::Rosa-reporter mice received a single dose of Tamoxifen totaling 40 µg/g body weight; the dose for the Lgr5-GFP-CreER::Rosa-reporter mice was 100 µg/g body weight. At the indicated time points specified in figures, tail skin was removed and treated with 20 mM EDTA (pH 8.0) for 2–4 hr at 37°C. Epidermis with attached hair follicles was removed from the dermis, fixed in 4% paraformaldehyde for 20 min, washed in PBS for >2 hr and then processed for staining or imaging. For the Lgr5-GFP-CreER::Rosa-stop-tdTomato::K14H2BGFP lineage tracing experiment, tail skin was removed and treated with 20 mM EDTA (pH 8.0) for 30 min at 37°C. Epidermis without hair follicles was removed from the dermis. The remaining dermal tissue with embedded hair follicles was fixed in 4% paraformaldehyde for 20 min, then washed for 1 hr in PBS and imaged without staining. For the mice more than 100 days old, the remaining dermal tissue was digested additionally in the collagenase (Sigma) for 1 hr and then washed with PBS before imaging to allow detection of fluorescence signal. Whole-mount tail skin images were acquired using a 20×0.75 objective lens. Z-stacks were acquired at a resolution of 1024×1024, or at 512×512 for large samples. Tissue and section samples were imaged with a Nikon A1-R confocal microscope. Microscopy data was analyzed using Imaris (3D software) with the 3D visualization module. To label distinct cell populations in hair germs at the chosen area of tail skin, pregnant mice were administered a single dose of Tamoxifen at E16.5, and the labeling pattern was established 48 hr later at E18.5 using embryos removed by Caesarian section. At this time point, the primary central follicle in tail skin follicle triplets is in the hair germ stage, while the secondary outer follicles have not yet been initiated. To continue lineage tracing, a foster mother nursed the remaining pups. At postnatal day 15 (P15), the initially labeled primary central follicles enter into the first telogen and the fates of the labeled cells were analyzed. At this stage the secondary outer follicles are in anagen and block the view of the telogen primary central follicle. Prior to imaging, the secondary outer hair follicles were plucked by tweezers, leaving only the central hair follicle in the P15 whole mount skin. To label specific cell populations at the placode and the hair peg stages, pregnant mice were administered a single dose of Tamoxifen at E17.5 and labeling patterns were established 48 hr latter at P1 when the primary central follicle is at the hair peg stage and the secondary outer follicles are at the placode stage. The fate of labeled cell populations was traced to P15 for the primary central follicle and P21 for the secondary outer follicles, when they enter into the resting phase separately. The development of tail skin hair follicles varies slightly, in both the anterior-posterior axis and in the dorsal-ventral axis. To label progenitor cells at defined developmental stages, only the middle one-third section along both the length and the width of dorsal tail skin was used to perform lineage-tracing experiments. Within this chosen area, hair follicle development consistently follows the above-mentioned pattern at the indicated time points. To count the number of HFSCs, multiple Z-stack images were taken for each whole mount of tail skin. For each individual telogen HF, only the cross section through the center of the hair shaft was used for counting. This was done by picking the Z slice with the largest hair shaft for each counted HF. Telogen HFSC number was counted as the outer layer of cells from the U-shaped bulge structure below the SG and above the secondary hair germ. 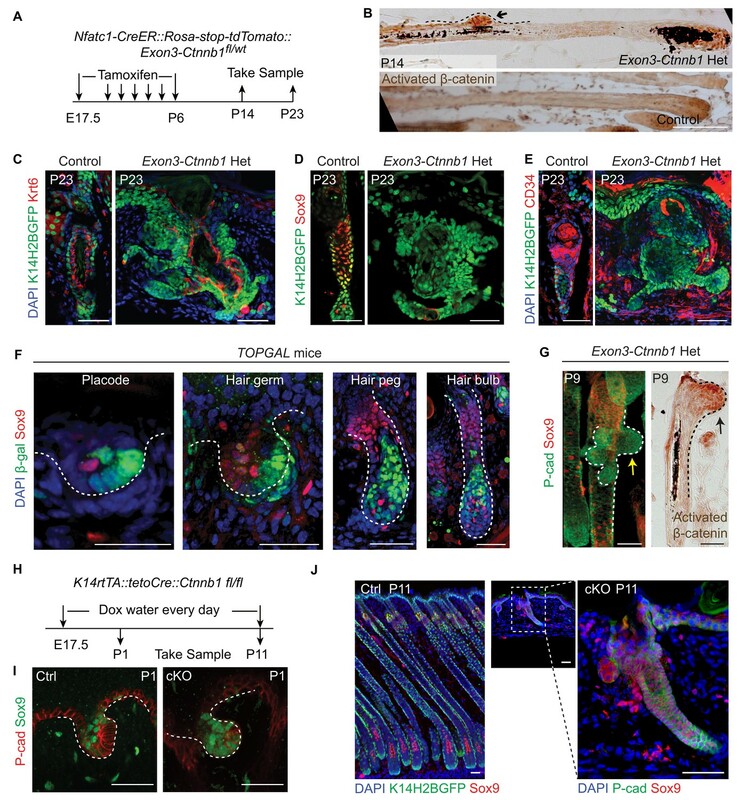 This standard was chosen based on section staining of tail skin hair follicles with HFSC markers (CD34 and Sox9) and niche cell marker (Krt6) (for reference, please see Figure 5C–E control HFs). P1 mice were anesthetized with cotton containing isoflurane and kept anesthetized on a 37°C heat stage during the imaging process with vaporized isoflurane through a gas tube connected to the head. The tail of the mouse was immobilized by tape and imaged directly under a water lens. Imaging was performed with a BX61WI (Olympus) microscope equipped with a Chameleon Ultra (COHERENT) two photon laser and a 25× water lens (Olympus, UIS2, N.A.1.05). A laser beam of 910 nm was used to simultaneously excite both H2BGFP and tdTomato. The step increment of the serial optical sections was 2 μm. Prior to laser ablation, Nfatc1-CreER::Rosa-stop-tdTomato::K14-H2BGFP pregnant mice were injected with a single dose of Tamoxifen at E17.5 to label distinct cell populations in hair pegs on tail skin. Laser ablation was carried out with a 910 nm beam scanning a region of 10 μm2 for less than 5 s. The power of the laser intensity was 1.86 mW, and less than 80% of the laser power was used. Neil Blue dye was used to tattoo a marker at the vicinity of the ablated area to help us retrieve the same laser ablated follicles more than 15 days later. To express the stabilized form of β-catenin in Nfatc1 expressing cells, Exon3-Ctnnb1fl/fl::Rosa-stop-tdTomatofl/fl mice were mated with Nfatc1-CreER mice. To induce the conditional expression of exon3-Ctnnb1, nursing mothers of Nfatc1-CreER::Rosa-stop-tdTomatofl/wt::Exon3-Ctnnb1fl/wt pups and WT littermates were intraperitoneally injected with Tamoxifen doses totaling 40 μg/g body weight for 8 days starting from E17.5. To generate K14-rtTA::teto-Cre::Ctnnb1fl/fl mice, K14-rtTA::teto-Cre mice were mated with Ctnnb1fl/fl mice. F1 male K14-rtTA::teto-Cre::Ctnnb1fl/wt progeny were subsequently mated with female homozygous Ctnnb1fl/fl. To induce deletion of Ctnnb1, the nursing mothers of K14-rtTA::teto-Cre::Ctnnb1fl/fl pups and WT littermates were given water containing 1 mg/ml doxycycline (Sigma) and chow containing 2 g/1000 g doxycycline (Research Diets Company) for periods specified in the figures. All mice were maintained in an SPF facility, and procedures were conducted in a manner consistent with the National Institute of Biological Sciences guide for the care and use of laboratory animals. For section staining, tissues were embedded in OCT compound and frozen. After cryosection (20–30 µm) and fixed for 10 min in 4% paraformaldehyde in PBS, sections were permeabilized for 10 min in 0.5% Triton (PBST) and blocked for 1 hr in a solution of 2% normal donkey serum, 1% BSA, and 0.3% Triton in PBS. The following antibodies were used: anti-GFP (Abcam, ab13970, 1:1000), anti-P-cad (R&D, BAF761, 1:500), anti-β-gal (Abcam, ab9361, 1:10,000), anti-β-catenin (Sigma C2206, 1:500), anti-Sox9 (Chen Lab, 1:50), anti-CD34 (ebioscience, 50-0341, 1:300), and anti-K6 (Chen Lab, 1:2000). For hematoxylin and eosin (H&E) staining, after cryosectioning (6–8 µm) and fixation for 10 min in 4% paraformaldehyde in PBS, sections were stained in haematoxylin (Fisher) for 30 s and then rinsed in running tap water and 0.3% acid alcohol. Eosin (Sigma) was used to treat the sections for 10 s. The haematoxylin and eosin dyes were prepared according to the manufacturers’ instructions. For the whole-mounts of tail skin, images were acquired using a 20× 0.75 objective lens. Z-stacks were acquired at a resolution of 1024×1024, or 512×512 for large samples. Tissue and section samples were imaged on a Nikon A1-R confocal microscope. Microscopy data were analyzed using Imaris (3D software) with the 3D visualization module. RBG images were assembled in Adobe Photoshop CS3 and panels were labeled with Adobe Illustrator CS6. Skin was fixed with 4% paraformaldehyde, embedded in paraffin, and sectioned at 5 µm. After de-waxing, sections were blocked with buffer from a MOM kit (Vector) with 0.1% Triton. Immunohistochemistry assays were then conducted by incubating sections at 4°C overnight with primary antibody β-catenin (Sigma C7207, 1:500), then secondary HRP Donkey-anti-mouse antibody (Jackson ImmunoResearch), followed by use of a DAB kit (Vector), according to the manufacturer’s instructions. RNA in situ hybridization was performed with an RNAscope 2-plex Detection Kit (Chromogenic) according to the manufacturer’s instructions. The RNAscope probes used were Axin2 (Catalog 400331) and Wnt10b (Catalog 401071). Isolation of Shh+ and Nfatc1+ cells for RNA-seq was performed using Shh- and Nfatc1-CreER::Rosa-stop-tdTomato::K14-H2BGFP mice. For purification of Nfatc1 expressing cells in hair pegs, pregnant mice were administered a single dose of Tamoxifen at E15.5. Then, at E17.5, embryonic back skin was removed and the whole skin was cut into 6–9 small pieces and placed, dermis side down, in a 0.25% trypsin solution (Gibco) at 37°C for 16 min. Single-cell suspensions were obtained by triturating the skin gently. Cells were then filtered with strainers (70 µm followed by 40 µm). For purification of Shh-expressing hair peg cells at E17.5, pregnant mice were administered a single dose of Tamoxifen at E15.5. Embryonic back skin was cut into 9 pieces and placed, dermis side down, in dispase (Life Technologies, 0.4 mg/ml) dissolved in PBS for 1 hr at 37°C. Epidermis containing placodes and hair germs were removed. Dermis samples containing only hair pegs were placed in a 0.25% trypsin solution at 37°C for 10 min. Single-cell suspensions were obtained by triturating the skin gently. Cells were then filtered with strainers (70 µm followed by 40 µm). For the cells used in the experiments presented in Figure 5—figure supplement 1D, back skin of Nfatc1-CreER::Rosa-stop-tdTomatofl/wt::K14-H2BGFP::Ctnnb1fl/wt Het and WT mice at either P23 or P100 was used. Skin was cut into 6 to 9 pieces and placed, dermis side down, in a 0.25% trypsin solution at 37°C for 30 min. Epithelium cells were harvested by gentle scraping and triturating. After filtering with strainers, cells were stained for 20 min on ice with Alexa647-CD34 antibody (ebioscience, 50-0341) where indicated and then washed. DAPI was used to exclude dead cells. Cell isolations were performed with a BD FACSAria III cell sorter equipped with FACSDiva software (BD Bioscience). GAPDH F, GGTGTGAACGGATTTGGCCGTATTG; GAPDH R, CCGTTGAATTTGCCGTGAGTGGAGT. RNA from FACS-purified cells was sent to the Biodynamic Optical Imaging Center at Peking University for quantification, RNA-seq library preparation, and sequencing. The libraries were sequenced on the illumina HiSeq 2500 platform using the Pair-End 2x100-bp sequencing strategy. For analysis, data was mapped to the mouse genome (GRCm38/mm10) using TopHat (v2.0.13) with default settings. Cufflinks (v2.2.1) was used to quantify changes in gene expression between the Nfatc1+ and Shh+ cells. Genes with significantly different expression levels (p<0.01 and log2FC>1) were chosen for further analysis. Gene ontology (GO) analysis of genes was done using DAVID (Database for Annotation, Visualization and Integrated Discovery). DNA was isolated from FACS-purified cells using a TIANamp Genomic DNA Kit (TIANGEN) according to the manufacturer’s instructions. The primers used to detect the β-catenin sequences flanking the exon3 region were: wild-type/un-recombined allele 900 bp; exon3 F, GACACCGCTGCGTGGACAATG; exon3 R, GTGGCTGACAGCAGCTTTTCT; recombined allele ~700 bp; exon3 F, GACACCGCTGCGTGGACAATG; exon3 R, ACGTGTGGCAAGTTCC GCGTCATCC. Box-and-Whisker plots prepared with Origin 9 (Origin Lab) software were used to illustrate the lineage tracing quantification results. Journal of Investigative Dermatology 133:890–898. The Journal of Cell Biology 163:609–623. Journal of Investigative Dermatology 118:216–225. Journal of Investigative Dermatology 113:523–532. Proceedings of the National Academy of Sciences of the United States of America 99:10482–10487. Thank you for submitting your work entitled "Embryonic attenuated Wnt/β-catenin signal defines niche location and long-term stem cells in hair follicle" for peer review at eLife. Your submission has been favorably evaluated by Janet Rossant (Senior editor), and two reviewers. 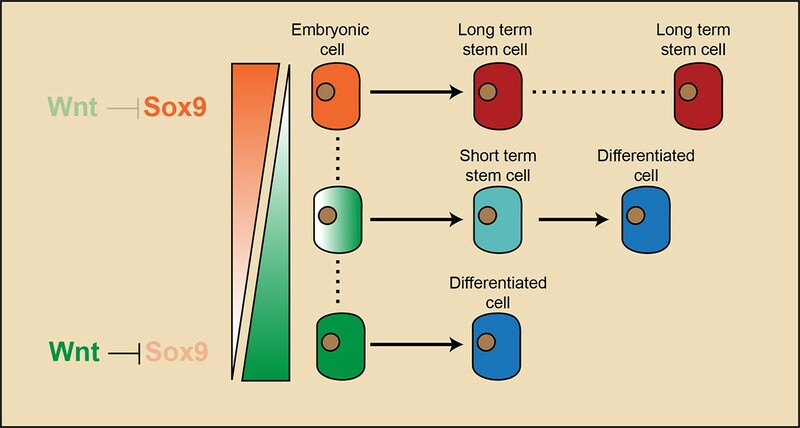 In this elegant and interesting study, Xu and colleagues ask a very important question, how are long term organ stem cells specified during development? Is hair follicle stem cell fate pre-determined at the early hair follicle developmental stages? Or, are they specified to be long term organ stem cells at different stages of development? They used multiple transgenic mice to trace cell lineage and found that Shh-expressing cells contribute to most of the HFSC, Nfatc1-expressing cells contribute to SG and upper bulge cells, and Lgr5-expressing cells contribute to lower bulge and SHG cells. By undertaking RNA-seq and using other transgenic lines, they also identified and demonstrated the attenuated Wnt/β-catenin signaling is required for HFSC specification. The reviewers noted that this is a beautifully executed and extremely interesting paper that makes an important contribution to our understanding of adult stem cell development in the hair follicle, and likely has implications for understanding how adult stem cells are established in other biological systems as well. Therefore, the paper will be of interest to stem cell biologists in all fields. They raised a few major points, mostly around interpretation of the data presented and the need for some more caution in some of the conclusions drawn. It was felt that these concerns could probably be addressed without any further major experimentation. 1) The authors show that laser ablation of Nfatc1-CreER-labeled cells in embryogenesis did not prevent formation of a new bulge from unlabeled cells; the authors interpret this result as meaning that the bulge can be formed from Nfatc1-negative cells. However, in the absence of data showing that 100% of Nfatc1-expressing cells are labeled in Nfatc1-CreER mice following a single injection of tamoxifen, this conclusion should include a caveat regarding labeling efficiency. And related to this point, in Figure 1, the authors mention that Nfatc1-expressing progenitor cells become SG cells and upper bulge cells. In Figure 2C, the authors claim that the formed HFSCs are negative for Nfatc1 at P23 after Nfatc1 ablation at P1, indicating they came from hair peg cells that used to be Nfatc1 negative. But the formed SG cells are Nfatc1 positive in Figure 2C but negative in Figure 2H, which is inconsistent. If Figure 2C is correct, where do these cells come from? 2) To understand the mechanisms underlying the different developmental potential of Shh-expressing and Nfatc1-expressing cells, the authors carried out transcriptional profiling on these two populations, and identified Wnt/β-catenin signaling as a pathway enriched in Shh-expressing and downregulated in Nfatc1-expressing cells. 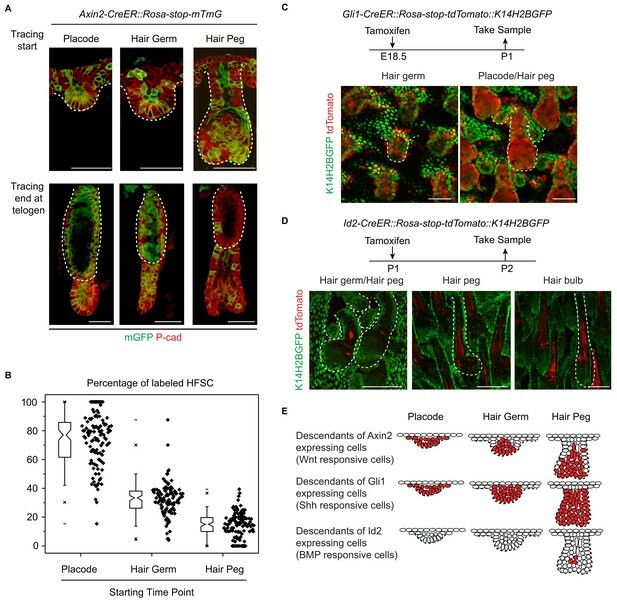 Lineage tracing with Axin2-CreER mice confirmed that while Axin2-expressing cells labeled at the hair placode stage can give rise to HFSCs, induction of Cre activity at the hair peg stage resulted in labeling of only a small percentage of HFSCs. The authors conclude that Wnt signaling attenuates the ability of cells to become HFSCs. In support of this, they demonstrate loss of HFSC markers in hair follicles following mutation of epithelial β-catenin to a constitutively active form. Conversely, deletion of epithelial β-catenin in late embryonic life causes expanded expression of the HFSC marker Sox9. While these data are consistent with the authors' hypothesis, it also remains possible that a minority of Axin2-positive (Wnt-responsive) cells, located in the upper follicle at the peg stage, does in fact contribute to HFSC rather than differentiating HF populations, and is distinguished from differentiating cells by lower levels and/or a different context of Wnt signaling. As it isn't clear that Lgr5+ and Axin2+ cells represent identical (rather than overlapping) populations, this alternate hypothesis could be tested by determining whether Axin2-lineage traced cells in the bulge compartment (Figure 4A) are maintained and/or expand, or conversely disappear, through successive cycles of hair growth. 3) The authors should consider further whether the conclusion at the end of the second paragraph of the subsection “Attenuated Wnt/β-catenin signal uniquely associates with embryonic niche “is correct or not. From placode to peg stage, a lot of proliferation, differentiation and other cellular events are involved. Is true that a specific group of cells can maintain active Wnt/β-catenin and then loss HFSC forming potential? The authors should consider whether Wnt signaling is a cause or a consequence of the differentiation process and modify their conclusions accordingly. 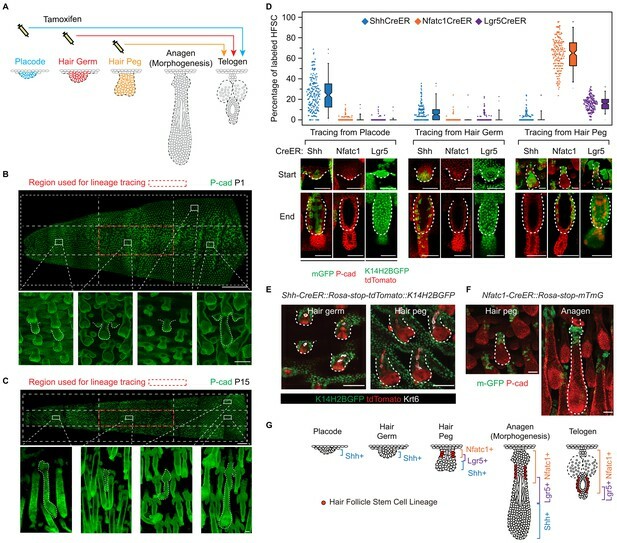 4) By using Shh, Nfatc1 and Lgr5-Cre lines to undertake lineage tracing from early development to the end of morphogenesis, the authors claim that HFSCs are specified at the hair peg stage. However, it is probably appropriate to conclude that HFSCs are derived from those progenitor cells, but not they are already specified at an early developmental stage. We appreciate the reviewers pointing out the caveat of the ablation experiment. We agree with the concerns and would like to first explain the experiment more fully. In Figure 1: the lineage tracing experiments used the dorsal middle 1/3 section of the tail whole mount for quantification (as explained in Figure 1B, C). Although hair follicles in this chosen region all follow the developmental pattern we described, we did observe slight variation in labeling efficiency after one Tamoxifen injection (please see added Figure 2—figure supplement 1). Specifically, hair follicles along the anterior-posterior midline of dorsal tail skin had the highest labeling efficiency compared to hair follicles on the sides. For this reason, we only conducted the ablation experiment in hair follicles along this midline in the chosen region. To illustrate our point please see Figure 2E: control hair follicles surrounding the ablated hair follicles have almost all of their bulge cells labeled after just one Tamoxifen injection at E17.5. But as the reviewers pointed out, even in this situation, we still cannot prove that we labeled and then ablated all of the cells that were Nfatc1 positive. Therefore, we have modified our conclusions accordingly based on the reviewers’ suggestions. Relevant labeling is also changed in Figure 2A. In Figure.2C, the labeled SG cells resulted from incomplete ablation of the Nfatc1-CreER labeled cells at the hair peg stage. Even though we did aim to specifically ablate all RFP positive cells in hair pegs, in a very few cases, we failed to fully achieve this. This was revealed by remnant RFP positive cells upon later observation. However, in the majority of our repeat experiments, we did successfully ablate all Nfatc1-CreER labeled hair peg cells, which resulted in neither SG nor bulges being labeled at later time points (as indicated by Figure 2E, H). We have changed the representative images in Figure 2C to more accurately reflect the results of the majority of the ablation experiments. We agree with the reviewers’ point. We are also interested in finding out the fate of the Axin2 positive cells located in the upper follicle that ended up in the bulge: are they long-term stem cells or not? Since it is not clear that Lgr5+ and Axin2+ cell are the same, we followed the fate of Axin2+ cells in long term lineage tracing experiments (please see new Figure 6B). After injecting Tamoxifen once at E17.5 to label Axin2+ hair peg cells, we got consistent labeling efficiency of the first telogen bulge (~15%). However, following just two rounds of successive hair cycles, most of the Axin2+ cells contributed bulge stem cells disappeared (please see new Figure 6B, C). This indicates that although a few Wnt signaling responsive cells in the hair peg participate in bulge formation, they are not long-term stem cells and tend to exhaust after participating in downstream proliferation and differentiation. These results suggest that embryonic exposure to Wnt/β-catenin signaling diminishes the long-term potential of adult HFSCs. We agree that the statement at the end of the second paragraph of the subsection “Attenuated Wnt/β-catenin signal uniquely associates with embryonic niche “was not fully supported by the data up to that point. Therefore, we have modified the conclusions according to the reviewers’ suggestions. Although we don’t have direct evidence to distinguish whether Wnt signaling is a cause or a consequence of the differentiation process, in our K14rtTA,tetoCre,β-catenin cKO animals, hair coat formation was aborted (see Figure 5H,I,J; Figure 5—figure supplement 1F). This indicates at least that epithelium Wnt/β-catenin signaling is required for terminal differentiation and hair formation. That being said, we do appreciate the reviewers’ suggestions that we should consider further and be more cautious when drawing conclusions. We have modified multiple statements in the paper to reflect this suggestion. We agree. It is more appropriate to conclude that HFSCs are derived from those progenitor cells. We have changed the corresponding conclusions based on this suggestion as well as multiple relevant statements in the paper. We are grateful to the NIBS Animal Facility for their expert handling and care of mice, the NIBS Biological Resource Centre for FACS sorting, the NIBS imaging facility for assistance with the two-photon microscope experiment, and the Peking University Biodynamic Optical Imaging Center for the RNA-seq sample processing. We thank all members of the Chen lab for discussions and technical support. We also thank N Tang, Y Zeng, R Xi, X Wang, F Shao, B Zhu, C Chang, and X Lim for discussion and manuscript reading. This work was supported by grants from the National Basic Research Program of China 973 Programs (2012CB518700 and 2014CB849602). Animal experimentation: This study was performed in strict accordance with the recommendations in the Guide for the Care and Use of Laboratory Animals of the National Institutes of Biological Sciences. All of the animals were handled according to the guidelines of the Chinese law regulating the usage of experimental animals and the protocols (M0020) approved by the Committee on the Ethics of Animal Experiments of the National Institute of Biological Sciences, Beijing. All surgery was performed under combination anesthesia involving isoflurane and remifentanyl and every effort was made to minimize discomfort and suffering.